Hockey Shops Prepare for Tremendous Demand for NHL® Double Rookie Class as 2013-14 Upper Deck Series One Hockey Arrives in Stores Today! Carlsbad, CA (November 06, 2013) – With the abbreviated 2012-13 NHL® season in the books, many trading card collectors and hockey fans alike have been eagerly anticipating the start of the 2013-14 season. Fans were not only excited to get a full season underway, but also because it gave the trading card world the unique position of offering a Double Rookie Class to NHL® collectors. And today is the day hockey fans can get their first opportunity to experience opening Upper Deck’s flagship NHL® brand and pull “Young Guns” rookie cards featuring the best rookies over the last two years. Since rookie cards are a huge driver for NHL® trading card sales, demand for the product both from consumers and dealers has far exceeded expectations and shops are reporting record setting numbers for 2013-14 NHL® Upper Deck Series One already. 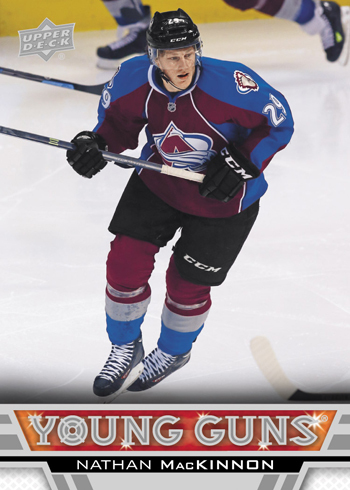 The “Young Guns” rookie cards have certainly become the NHL® rookie card that most hockey collectors chase. And this season with huge prospects like Nail Yakupov, Nathan MacKinnon, Tomas Hertl, Alex Galchenyuk, Seth Jones, Jonathan Huberdeau, Sean Monahan and more included in that checklist, hockey fans throughout the U.S. and Canada have plenty of great players to find in packs of 2013-14 NHL® Upper Deck Series One. These “Young Guns” rookie cards fall 1:4 packs for hobby boxes and collectors can find an average of 6 per box. Rookie content is also extended to a variety of subsets with Upper Deck’s MVP rookie cards can be found one per box on average and the Canvas versions of the “Young Guns” cards, which include different images on a premium textured trading card, fall at 1:48 packs. It is not just about the rookies however. The base set is always highly collectible and includes compelling action photography with 200 base cards and 50 rookie cards to collect. The “Shining Stars” insert cards are a beautifully designed technology driven series to chase with a bevy of key position players featured, and rare rainbow parallel cards to discover randomly inserted into packs. Another technology-based insert set that features the best goaltenders in the NHL® is the “Clear Cuts Stoppers” set that are actually printed on acetate and die-cut. There are also “Clear Cut Honoured Members,” “Clear Cut Foundations” and “Clear Cut Leaders” cards that also utilize this technology that collectors will enjoy searching for in packs. Memorabilia collectors will get a kick out of Upper Deck’s Game Jersey and Game Jersey Patch memorabilia cards. The Game Jersey cards fall two per box on average and the Game Jersey Patch parallel versions are limited to just 15 total copies. Also returning for this release are the extremely popular and very limited “A Piece of History 300 Win Club” jersey cards. Autograph collectors will love finding rare “Signature Sensations” cards that feature authentic autographs from key NHL® players and fall at approximately one per case. One of the biggest thrills for die-hard Upper Deck NHL® collectors is the return of the “Lord Stanley’s Heroes” hologram cards that feature a variety of current stars and legendary names like Wayne Gretzky and Bobby Orr. Upper Deck put a twist on this popular series by also creating “Lord Stanley’s Futures” hologram cards that focus on standout rookies who are destined for greatness in the NHL®. Upper Deck was prepared for heightened demand for this release, but the demand has been so significant that earlier this week the company announced a sell out on 2013-14 NHL® Upper Deck Series One. The product is truly a collectible that hockey fans everywhere will be looking to collect for years to come. The 2013-14 NHL® Upper Deck Series One trading card product features 24 packs per box, 8 cards per pack and is currently available at retailers throughout the United States and Canada.